This entry was posted in NZ poetry, NZ poetry event, Uncategorized and tagged NZ Poetry Day on August 16, 2018 by Paula Green. It was The PM Awards BTW! I like this poem! I wonder how old he was? Not that that matters. This entry was posted in NZ poems, NZ poetry, Uncategorized and tagged bart English, NZ Poetry Day on August 22, 2017 by Paula Green. how rocks are not quite lands. To mark the 20th anniversary of Phantom Billstickers National Poetry Day (NPD), 20 leading Kiwi poets were asked to select one of their own poems, something they felt spoke to New Zealanders now. They also chose a poem by an emerging poet, writers they feel make essential reading for us in 2017. The result is the 20/20 Collection – 40 poems by New Zealand poets who represent the diversity and vibrancy of talent in our contemporary national literature. The list includes Poet Laureates, Ockham New Zealand Book Awards winners, and strong new voices from recent collections and anthologies. NPD has been running continuously since 1997 and is always celebrated on the last Friday in August. Poetry enthusiasts from all over New Zealand organise a feast of events – from poetry slams to flash and pop-up events – in venues that include schools, libraries, bars, galleries, surf clubs, and parks. This year’s NPD will be held on Friday 25 August. Launched on May 24, the 20/20 Collection will be published in groups of ten poems between now and NPD. Featured poets are: Jenny Bornholdt and her pick, Ish Doney; Paula Green and Simone Kaho; Vincent O’Sullivan and Lynley Edmeade; Apirana Taylor and Kiri Piahana Wong; Alison Wong and Chris Tse; Tusiata Avia and Teresia Teaiwa; Kevin Ireland and Gregory Kan; Diana Bridge and John Dennison; Andrew Johnston and Bill Nelson; Michael Harlow and Paul Schimmel; C.K. Stead and Johanna Emeney; David Eggleton and Leilani Tamu; Elizabeth Smither and Rob Hack; Richard Reeve and Michael Steven; Robert Sullivan and Ngahuia Te Awekotuku; Bill Manhire and Louise Wallace; Selina Tusitala Marsh and Reihana Robinson; Cilla McQueen and David Holmes; James Norcliffe and Marisa Capetta; and Brian Turner and Jillian Sullivan. Many of the poets featured in the 20/20 Collection will take part in events on 25 August, Phantom Billstickers National Poetry Day 2017. Event organisers are encouraged to register their poetry event online as soon as possible: http://www.nzbookawards.nz/national-poetry-day/how-to-register-your-event/. Phantom Billstickers National Poetry Day is proudly administered by the New Zealand Book Awards Trust. National Poetry Day was established in 1997 with a mandate to celebrate discovery, diversity, community and pushing boundaries. It is a one-day national poetry-event extravaganza held on the last Friday of August each year. This is the second year of National Poetry Day operating under the sponsorship of Phantom Billstickers. Phantom Billstickers is a street poster company which has consistently helped New Zealanders express themselves since 1982. Recognising and supporting home-grown talent has always sat comfortably alongside its commercial campaign work. Phantom actively promotes New Zealand music, art, poetry and culture around the country and across the world, putting poetry on posters and a literary mix of work into cafes via its quarterly magazine Café Reader. The New Zealand Book Awards Trust was established as a charitable trust in 2014 to govern and manage the country’s two major literary awards – The Ockham New Zealand Book Awards and the New Zealand Book Awards for Children & Young Adults – as well as National Poetry Day, and to ensure their longevity and credibility. figure in Pacific studies, and ​the committee hopes that her inclusion in 20/20 encourages more people to seek out her important creative and critical work. Paula Morris (Ngati Wai, Ngati Whatua) is an award-winning novelist, short story writer and essayist. A frequent book reviewer, interviewer and festival chair, Paula holds degrees from universities in New Zealand, the U.K. and the US, including a D.Phil from the University of York and an MFA from the Iowa Writers’ Workshop. She is convenor of the Master in Creative Writing programme at the University of Auckland in New Zealand. This entry was posted in NZ author, NZ poems, NZ poetry, Uncategorized and tagged Gregory Kan, Kevin Ireland, NZ Poetry Day on June 30, 2017 by Paula Green. This entry was posted in NZ poems, NZ poetry event, Uncategorized and tagged NZ Poetry Day on August 5, 2016 by Paula Green. Happy Poetry Day from Poetry Shelf – 20 things to do that aren’t on the poster! check out the poem that our wonderful new Poet Laureate, CK Stead, included in my birthday book. Today is his welcome-to-Poet-Laureateship do. I will be there to celebrate! Congratulations! 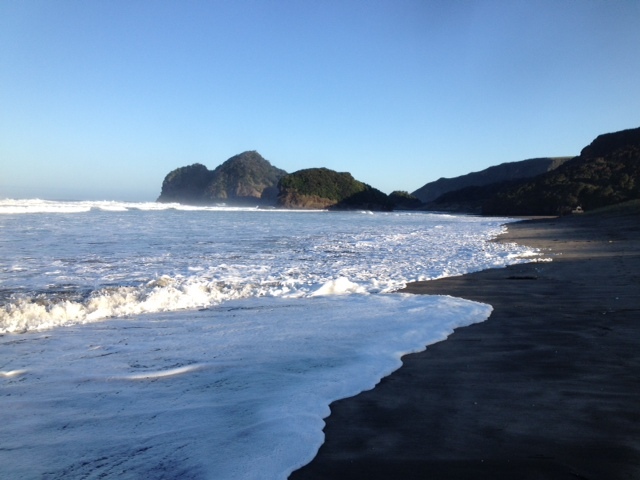 This entry was posted in NZ author, NZ poetry, NZ poetry book, NZ poetry event, NZ Poetry reading and tagged CK Stead, Jack Ross, NZ Poetry Day on August 28, 2015 by Paula Green. 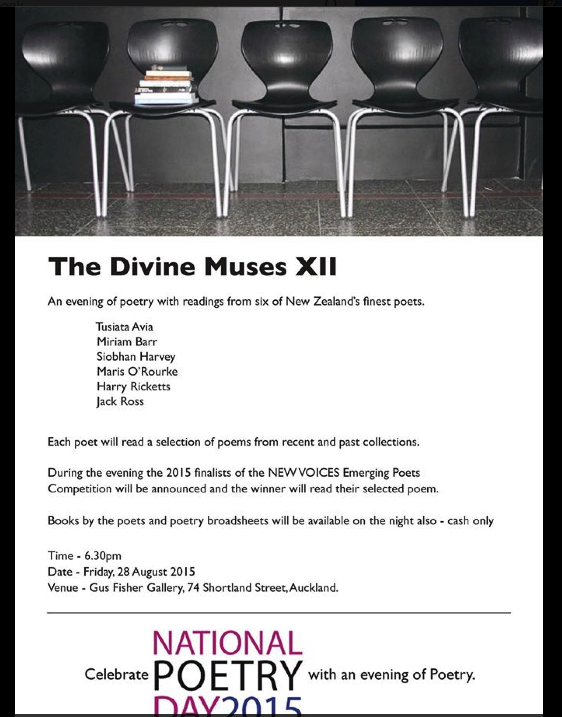 Divine Muses at Gus Fisher Gallery on Poetry day – should be good!